Ken Meyer, former US Air Force Police Veteran, and safety expert, is going for a walk; along with his faithful service dog Hope. However, this 628-mile journey is no normal walk in the park, and it will encompass days of traveling by foot from the kick off destination of the Veterans of Foreign Wars Post #4709, Saturday morning, April 16, at 10:00 am. Meyer will head to College Station, Bastrop, Temple/Killeen/Fort Hood, Waco, Midlothian, Ennis, Corsicana, Madisonville, Huntsville, Houston, Galveston, and ultimately end on the Bolivar Peninsula. Additional stops have been added to the walk as the time grows near for Meyer to begin the journey. Check the Web page for additional stops. 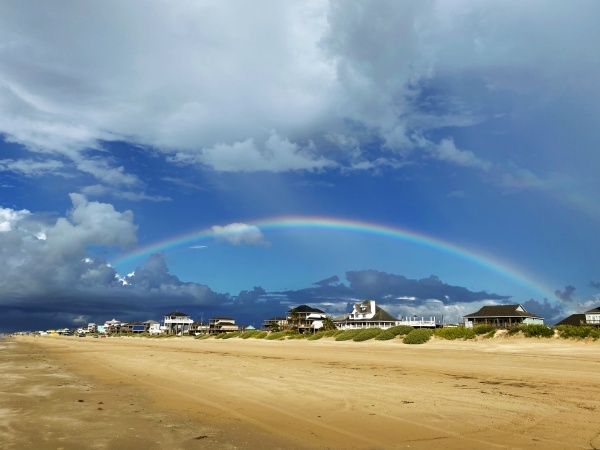 Upon arrival on the Bolivar Peninsula, he will present a beloved family flag belonging to his grandfather to the officials of Texas Frog Fest to open this fun-filled event (Texas Frog Fest, May 28-29, WEBSITE). All the proceeds from the Frog Fest, which is becoming a staple of entertainment in Southeast Texas, go to the work of the Lone Survivor Foundation. A beautiful new retreat center to house veterans and their families in a retreat atmosphere has been completed and offers a time for renewal and refreshment for these men and women that have given so much. If one asks Meyer why he is endeavoring to walk 628 miles in the hot Southeast Texas climate, he will quietly and thoughtfully likely say that he wants to give back. He has come through a long and adventurous journey and battled post traumatic stress along the way. At three points in his life, after returning from service, first responder duties, and an attack by a huge grizzly bear, Meyer was suicidal and wanted to end his own life. He will end his statement with, “Never quit. Keep on fighting. Life is worth living.” The walk is Meyer’s way of showing support to those who are presently battling the disease and to call attention to the huge issue for those who are not familiar with the problem. The Never Quit Walk is dedicated to the 19 servicemen who lost their life in Operation Red Wings on June 28, 2005, and to the estimated 22 veterans who lose the battle to PTS every day. Just what is post traumatic stress and how does it affect our veterans? “Post traumatic stress (PTS) is a mental health condition that’s triggered by a terrifying event — either experiencing it or witnessing it. Symptoms may include flashbacks, nightmares and severe anxiety, as well as uncontrollable thoughts about the event,” according to the Mayo Clinic. “Many people who go through traumatic events have difficulty adjusting and coping for a while, but they don’t have PTS — with time and good self-care, they usually get better. But if the symptoms get worse or last for months or even years and interfere with your functioning, you may have PTS. Getting effective treatment after PTS symptoms develop can be critical to reduce symptoms and improve function,” according to Mayo Clinic. Post traumatic stress symptoms may start within three months of a traumatic event, but in other cases, the symptoms do not occur until years after the event. That is one reason these symptoms are so hard to identify and catch. They cause significant problems in social or work situations and in relationships. Meyers said that most families go through life-changing situations while their veteran is struggling to find himself. The basic PTS symptoms are generally categorized into four types — Intrusive memories, avoidance, negative changes in thinking and mood, or changes in emotional reactions. Intrusive memories may include distressing and unwanted memories of the tragic event(s), reliving the event as if it were happening again (often called ‘flashbacks’), upsetting dreams that feel very real, and severe emotional distress or physical reactions to something or someone that reminds the veteran of the event. Avoidance may include trying very hard to avoid thinking or talking about the traumatic event and avoiding places, activities, or people that remind you of the event. Meyer experienced changes in thinking and mood as he tried to cope with his experiences on his own. They included negative feelings about himself and other people, inability to experience positive emotions, feeling of emotional numbness, a lack of interest in things that once held his interest, hopelessness, and memory problems, along with a drain on maintaining close relationships. He said that his family has been wonderful to him, but that he knows he put them through hell while on the continued road to recovery. Changes in emotional reactions, also referred to as arousal symptoms, may include irritability, angry outbursts, aggressive behavior, always being on guard for real or perceived danger. Feelings of overwhelming guilt or shame, self-destructive behavior such as drinking too much or driving too fast, trouble concentrating, trouble sleeping, and being easily startled or frightened can also be a part of this stress related experience. Experts say that if you have disturbing thoughts and feelings about a traumatic event for more than a month, if they are severe, or if you feel you have trouble getting your life back under control, talk to a health care professional. Get treatment as soon as possible to help prevent PTS from taking over your life. “Talk to someone about what you are feeling,” advises Meyer. Use 800-273-8255 to reach the National Suicide Prevention Lifeline, and press 1 to speak to a Veteran’s Crisis Line. Veterans, a fellow veteran and a survivor is walking 628 miles to call attention to your plight and wants you to know you are not alone. There are still opportunities for sponsorship for things Meyer will need to complete this heroic effort. And, you can come out and walk with Meyer for as long or as short a distance as you prefer.